Earlier this month, The Oklahoma Film & Music Office announced in a press release that pre-production for the film adaptation of the playAUGUST: OSAGE COUNTY has begun in Bartlesville, Oklahoma. Stamped by the New York Times as “probably the most exciting new American play Broadway has seen in years,” AUGUST: OSAGE COUNTY, written by Oklahoma native Tracy Letts, has won five Tony awards including Best Play and a Pulitzer Prize for Drama in 2008. I’m thrilled that AUGUST: OSAGE COUNTY will be filming in the county that inspired the Pulitzer play, and which the film screenplay has also been based on. Filming will be at locations in bothOsage and Washington counties in Northeastern Oklahoma. The authenticity of locations will be a huge asset to the production which will begin principal photography in the area on September 24. The story of AUGUST: OSAGE COUNTY revolves around the dysfunctional Weston family whose members gather at their Osage County family home after their patriarch’s disappearance. Directed by John Wells (The Company Men, ER) and produced by George Clooney, Grant Heslov, Jean Doumanian and Steve Traxler, the cast is also equally impressive. It includes two well-loved Oscar-winning actresses Meryl Streep and Julia Roberts, along with Abigail Breslin (Little Miss Sunshine, Definitely, Maybe, New Year’s Eve), Dermot Mulroney, and many others. “After seeing Meryl Streep’s mesmerizing portrayal as Margaret Thatcher in The Iron Lady, it has me even more excited and proud to co-star with her,” says Julia Roberts. 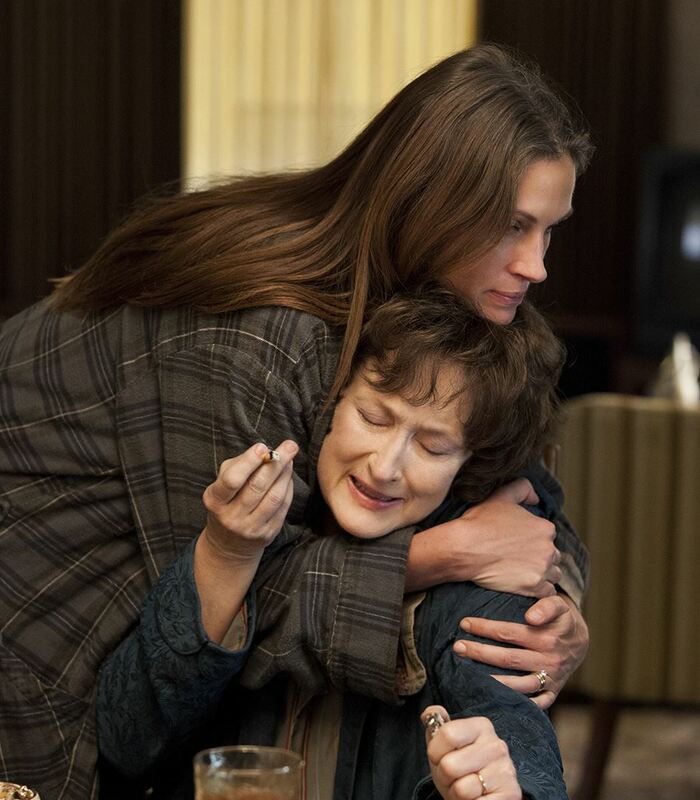 PHOTO CREDITS: Production still of Meryl Streep and Julia Roberts in AUGUST: OSAGE COUNTY - via Google. Last Saturday, over 4000 hopeful Tulsa citizens lined up at the Tulsa Promenade mall for a chance to be extras in the movie. The odds of being picked are “probably about 1,000 to 1, but that’s the chance you take,” says Suzi Watson, the 1,000th person to go through the brief evaluation process. If chosen, they may be called on to come to work with as little as 24 to 48 hours’ notice. Filming will be from Mondays through Fridays only, no weekends. 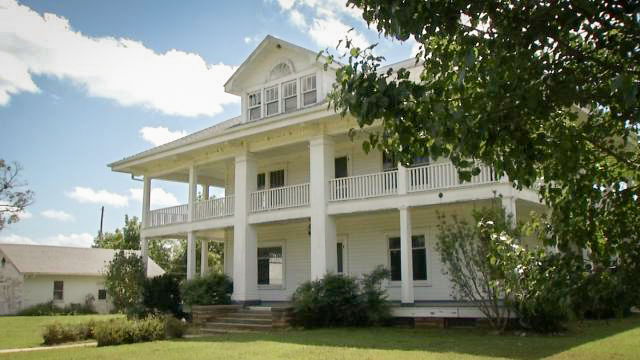 One of the film locations of AUGUST: OSAGE COUNTY is the hundred-year-old Boulanger home, located on 22 acres in Boulanger north of Pawhuska. The ten-room Sears, Roebuck and Company house was built in the 1910’s for the town’s founder and his wife, Isaac Walter and Grace Boulanger. In addition to the large historic house, the property also includes several barns and ponds. Construction cost for the house was around $5,000. August OC Film bought it recently for $250,000. PHOTO CREDIT: Above photo of the Boulanger home is from here. As to its history, the house belongs for many years to the Boulanger family before it became a bed and breakfast in 2000. Once the location scout for the production saw the house, it was not long before an offer was on the table to buy it. “This is one of those homes that you walk in and it’s just amazing. The feel is so welcoming,” said Natascha Holloway, a real estate agent for United Country Shaw Real Estate, the company that helped sell the house to the movie production. “There’s a lot of natural light that comes in through that house and it’s just great to be on the grounds because it is amazing and of course you’re surrounded by country side.” Rumor has it the realtors have already found another buyer for the house once the movie is complete. PHOTO CREDIT: On-the-set still photo of the play AUGUST: OSAGE COUNTY (performed at The Curran Theater in San Francisco, California) - via Google. The growth mentioned above includes another featured film made in Osage County in 2010,Terrence Malick’s romantic drama To The Wonder, starring Rachel Weisz, Ben Affleck, Rachel McAdams, and Amanda Peet. PHOTO CREDIT: Above still photo of To The Wonder via Google. 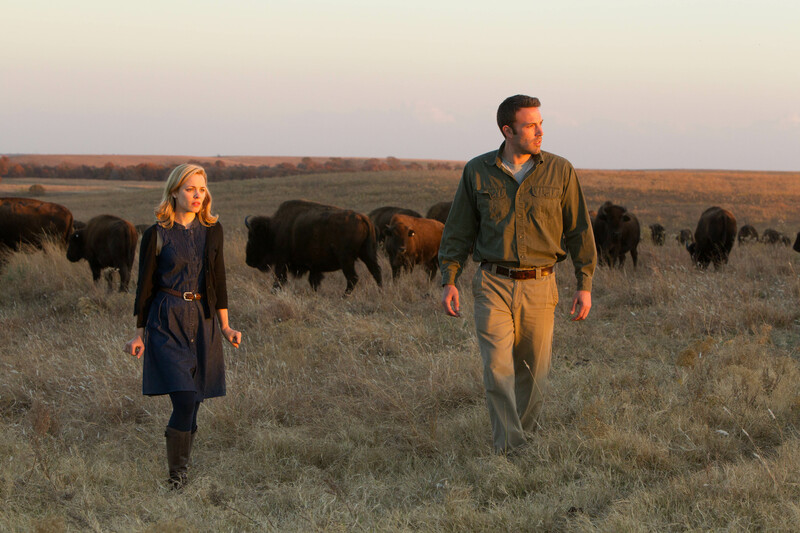 With the Oklahoma Film Enhancement Rebate Program under its wings, To The Wonder was filmed in the fall of 2010 and early 2011 around the Bartlesville, Pawhuska areas, and Tulsa, Oklahoma. It was also filmed in Paris, France. Terence Malick, the director and writer of To The Wonder, also spent many years of his youth in Bartlesville, where to this day his father still resides. To The Wonder will have its world premiere on September 2, 2012, at the 69th Venice Film Festival (August 29 - September 8, 2012) on the island of the Lido, Venice, Italy. With one of the most generous rebate program for productions filming in the state - up to 37% cash rebate - The Oklahoma Film & Music Office works tirelessly to attract film, television, video, and music industries to Oklahoma. For more information, check out the Oklahoma Film & Music Office’s website atwww.oklahomafilm.org.